The shameless hypocrisy and its underlying message are clear. The author is a senior rabbi from Kfar Chabad, Israel. He is the spokesman of the Chabad youth movement center Tze'irei Agudas Chabad in Israel and the editor of the nationally distributed Chabad weekly Sichat Hashavua. He is also the official Chabad spokesman in the Israeli media. There is no forgiveness for passing classified information to help Israel...but Jewish blood is cheap. 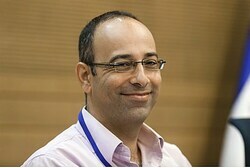 The American administration, which claims it does not interfere in "the decisions of the justice system”, successfully pressured the Israeli government to demonstrate complete contempt towards the decisions of Israel’s justice system and to ignore fundamental principles of law by releasing the unrepentant murderers of innocent men, women and children from Israel’s prisons. The US Ambassador to Israel, Dan Shapiro, recently declared that the release of Jonathan Pollard from prison should not be expected any time soon. The Israeli-Palestinian conflict is familiar to almost everyone; some would say much too familiar, as it seems incessant and intractable. For many who have an opinion on the matter, a “two state solution” seems to be the obvious, if elusive, direction to look. I became interested in the modern situation of the Jewish people and, therefore, this conflict, in 1998. Until recently, I have accepted the common wisdom that the only way forward was “two states for two peoples”. What changed my mind? Add one more naqba, catastrophe, to Palestinian victimhood, courtesy of the New York Times. And one more opportunity to bash Israel. In its Nov. 22 edition, the Times runs a two-column headline that reads: "2 Lions, Their Birth Hailed by Gaza, Die Within Days." According to correspondent Fares Akram reporting from the Gaza Strip, the birth of two lion cubs at a Gaza zoo was hailed by Hamas rulers as "a triumph over the proverbial hardship of life in this Palestinian coastal enclave." The cubs became "symbols of resistance." The only reason Iran has come to the table after a decade of contemptuous stonewalling is that economic sanctions have cut so deeply — Iran’s currency has collapsed, inflation is rampant — that the regime fears a threat to its very survival. Cairo, Asharq Al-Awsat—Egypt’s security forces dispersed a demonstration by students affiliated with the Muslim Brotherhood who attempted to storm the Al-Azhar institute in southern Cairo on Wednesday. The police also evacuated Tahrir Square following violent clashes with pro-Brotherhood protesters. At least two people were killed and 40 others injured when the police dispersed protesters who were commemorating the civil unrest and clashes with the security forces in 2011 which left dozens of protesters dead, medical sources informed Asharq Al-Awsat. Former Accountant General says centralization robs Israelis of purchasing power, puts country’s future at risk. Centralization in Israel’s economy not only robs many citizens of their purchasing power, but puts the country’s economic future at risk, economist and former Accountant General Yaron Zelicha warned, speaking this week at the Real Estate Conference in Eilat. Addressing the conference, Zelicha called for a “new economic policy,” and slammed Finance Minister Yair Lapid. BETHLEHEM (Ma'an) -- Palestinian negotiator Mohammad Shtayyeh will not return for future peace negotiation sessions with Israel, a Palestinian official said Thursday. A Palestinian official, speaking on the condition of anonymity, told Ma'an that Shtayyeh will definitely not be returning to the negotiations team after resigning last week. Another Palestine Liberation Organization official will replace Shtayyeh and join Chief Negotiator Saeb Erekat in a negotiation session scheduled for next week, the official said. Kerry calls out Israel's own weakness. Arabs have little reason to expect that law will be enforced and crime duly punished. Shock and outrage have resonated through the pro-Israel world after a thinly-veiled threat was directed at Israel by U.S. Secretary of State John Kerry last week. As part of the Obama Administration’s ongoing effort to strong-arm Israel into coughing up harmful concessions to the Palestinian Authority, Kerry warned that if the present negotiations fail Israel will face an “intifada” – the Arabic expression for a violent terrorist uprising. Traditionally, it has been the tactic of the Arabs to combine the threat of violence with diplomacy. The outrage in this instance stems from the sorry sight of the United States likewise stooping to the low level of threatening the lives of innocent Israeli civilians, in the name of “peace” no less. The danger, of course, is that the U.S. has now irresponsibly provided a motive and justification for an eruption of Arab violence. The core assumption in Secretary Kerry’s remark is that Israel lacks the self-respect and confidence to carry out justice, and shall instead willingly suffer some measure of Palestinian-Arab terrorism. Though Kerry is certainly seeking to prey upon it, this is a weakness of Israel’s own making. There’s been Black Pride, Gay Pride and even Jewish Pride, and now, it seems, the New Israel Fund (NIF) is poised to start pushing for one more self-empowering political movement that might very well be called Progressive Pride. “You have every right to speak out for the Israel you want to see!” a new NIF video exclaimed at the annual NIF gala dinner held in Manhattan this week. Ottoman Turkish Empire lay defeated at the end of World War I.
recorded history – let alone an Arab independent state of Palestine. correctly as Israel – not Palestine. Last week, Palestinian Media Watch reported that the Palestinian Authority Minister of Religious Affairs Mahmoud Al-Habbash said Jews had killed Yasser Arafat by poison, just as the Jews of the town of Khaibar had killed Islam's Prophet Muhammad. "It's obvious that Israel wasn't alone [in poisoning Arafat]; the US was there. That fool known as [George] Bush took away Yasser Arafat's protection and gave [Israeli PM] Sharon the green light to liquidate Yasser Arafat." President Obama wants Iran to suspend parts of its nuclear program in return for easing international economic sanctions. Critics contend that if the West strikes a deal along these lines, Iran could cheat far more easily than the rest of the world could reinstate tough sanctions. But Mr. Obama insists that relaxing sanctions is reversible: If the Iranians are "not following through," he recently told NBC News, "We can crank that dial back up." Peace and arms-control agreements have a long history that warns against such assurances. Democratic countries have time and again failed to get what they bargained for with their undemocratic antagonists—and then found themselves unable or unwilling to enforce the bargain. Today I called the White House switchboard (202-456-1111) and left a message for the President. There is so much at stake and the talk of lessening the sanctions against Iran are absurd. We know that Iran is using the 'talk about sanctions' time to continue its progress toward a nuclear bomb. There is absolutely no doubt about this. That country has not been lying about its plan to wipe Western civilization off the face of the earth. Unfortunately, President Obama has shown his inability to understand the language of the Middle East - saying one thing and doing another. The risks are too high to take a chance and we must believe Obama when he says that 'he was not informed' as has happened with the fiasco of Obamacare. He has been informed about the heinous plan of the radical Islamist country's leadership and that cannot be denied!!! New rifts in U.S.-Israeli cooperation could mean that time is running out for peaceful resolution of the Iranian nuclear issue. America and Israel are in uncharted waters. Just eight months since President Barack Obama visited Israel on the first foreign trip of his second term in an attempt to patch things up with Prime Minister Benjamin Netanyahu, the two close allies are at odds once again -- this time over a proposed "first step" nuclear agreement with Iran. Washington and Jerusalem eventually will find a way to move beyond this titanic clash, but no kiss-and-make-up effort can erase the scars that will be left behind. The current crisis is already one of the biggest U.S.-Israel blowups, ever -- and it could get worse before it gets better. Dr. Aaron Lerner - IMRA: Here is how the independent Palestinian news agency, Maan, puts it: "The Al-Aqsa Martyrs' Brigades are the military wing of Fatah, which is in control of the Palestinian Authority in the West Bank." That's right. An illegal armed militia is the "military wing" of our "peace partners". I’ve always been fascinated by how well the Israeli Defense Force, otherwise known as the IDF, delivers emergency response medical care in extremely poor conditions. My first experience with the IDF was in Haiti after the devastation of the earthquake there. They were remarkable then, triaging and treating patients in the midst of the devastation. 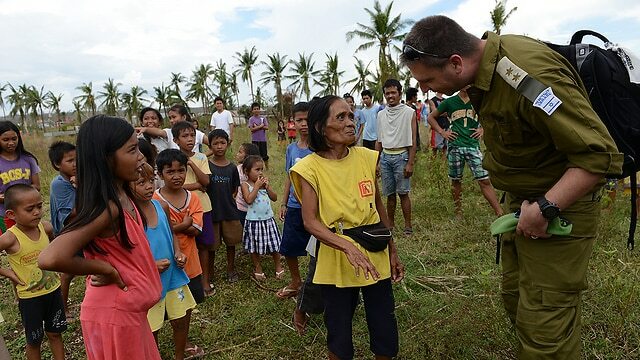 The IDF had selected Bogo, a small village on the northern island of Mactan, to establish its emergency response center. Bogo had been hard hit by the devastation but it hadn’t attracted as much attention as other towns. It was definitely off the beaten path.I knew we had found the IDF medical team as soon as we arrived at the hospital where they were working. A fence surrounded the grounds; soldiers were stationed at the entry and sharp shooters were visible from rooftops. Security is of paramount importance to the Israelis and they will survey potential sites for days to before one is selected. Upon the 40th anniversary of Prime Minister Ben Gurion’s death, Israeli and American policy-makers should study the 1948 legacy of Israel’s Founding Father: Defiance of disproportionate US pressure forged Israel into a national security producer rather than a national security consumer, catapulted the Jewish state into the most productive US strategic ally, enhanced the long-term US-Israel mutually-beneficial ties (following short-term tension), and advanced the national security of both the US and Israel. On May 29, 1949, toward the end of Israel’s War of Independence, which consumed 6,000 Israeli lives (1% of the population! ), the US Ambassador to Israel, James McDonald, delivered a scolding message from President Truman to Prime Minister Ben Gurion. According to McDonald, Truman “interpreted Israel’s attitude [rejecting the land-for-peace principle; annexing West Jerusalem; refusing to absorb Arab refugees; pro-actively soliciting a massive Jewish ingathering] as dangerous to peace and as indicating disregard of the UN General Assembly resolutions of November 29, 1947 [the partition plan] and December 11, 1948 [refugees and internationalization of Jerusalem], reaffirming insistence that territorial compensation should be made [by Israel] for territory taken in excess of November 29 [40% beyond the partition plan! ], and that tangible refugee concessions should be made [by Israel] now as essential, preliminary to any prospect for general settlement.